September will see the launch of Suzuki’s new Skywave 650 – a big bore scooter aimed at bikes like Yamaha’s T-max and Honda’s Silverwing. Like its competitors, the bike will use a two-cylinder engine making around 50bhp, bolted to a continuously variable transmission. The result should be a top speed of well over 100mph and all the ease of use of a smaller twist-and-go. 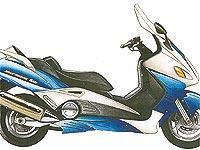 While the bike will go under the Skywave tag in its native Japan, it might be called the Burgman 650 in Europe. The smaller Burgman 400 and 250 models are already called Skywave in Japan. The firm will also face tough competition from Italy. Piaggio already makes a 500cc scooter in the form of its X9 500, but its single-cylinder bike is no match for the Japanese competition in either performance or handling. However, sources in Italy claim the firm is working on a new two-cylinder motor with a capacity of between 675cc and 700cc. Again fitted with a twist-and-go transmission, the engine is due to be used in a big bore scooter, which will debut next year. Italian insiders also claim the new engine will be bolted to a machine that is closer to a motorcycle than a scooter – combining the chassis design and handling of a " real " bike with the easy-to-use continuously variable transmission of the scooter. This is an idea Yamaha is also working on – sources in Japan say the firm is developing a 500cc TDM-style machine using the engine and transmission of the T-max.